Capture special memories with First Edition’s party papercraft collection, Let’s Celebrate. Amongst contemporary colours and patterns, you can find Louise Tiler’s beautiful illustrations of pandas, flamingos, and adorable dogs alongside fun party-themed designs of ice-cream, balloons, birthday candles and bunting. Just look at these papers… pastels, pooches, pandas – a winning combination! These papers also feature UV effects, glitter and gold foil for that extra special touch. Embrace the essence of tropical rainforests with Botanical Beauty. Designed in a rich green and blue colour palette, Katie Pertiet’s selection of nature-inspired designs offer decadent patterns to create some really eye-catching projects. We’re dreaming of warmer climates just looking at these papers. Bursting with tropical flowers, parrots and foliage, we can’t wait to see what you do with these papers! 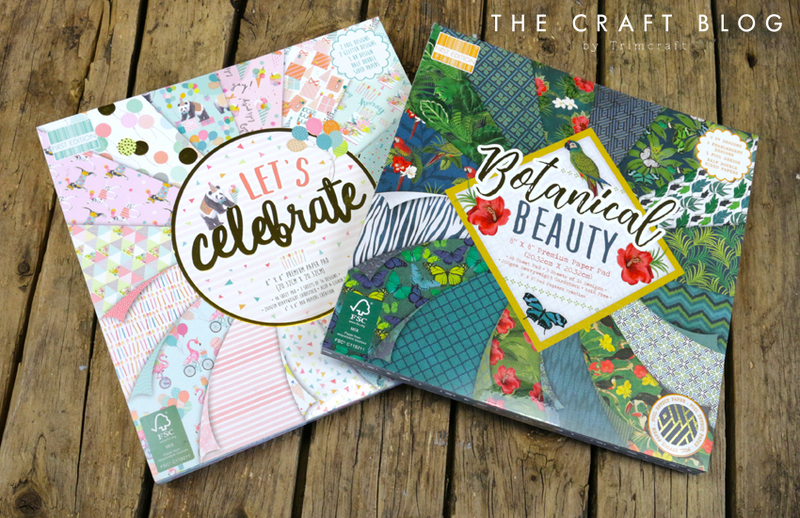 These papers are SO versatile, so you can create projects for lots of different occasions. This paper pad also features a foil effect, UV designs and pearl effect papers to make them extra special! Crafters, what do you think? We just can’t decide which our favourite is! Keep your eyes peeled in stores for these in the next few weeks. Do you have a favourite out of the two new paper pads? Let us know in the comments box below and keep an eye out across our social media for more of these beautiful designs! Fabulous! I like both of them! Loving the pastels in "Let's Celebrate" but also loving the rich colours and foiling in "Botanical Beauty"!!! Two lovely paper pads, my favourite is the Botanical Beauty. Fabulous pad for your holiday layouts! Your papers are just the best. The patterns are always so fresh and lovely. I'm loving the rich colours of the Botanical Beauty. More papers to buy and keep to just love them! WOW thesse collections are both really beautiful in each their way, as they´re sooo different from each other. I LOVE, that you´ve made some with foil and glitter, that is just sooo my thing to be honest he he. I love pastel colors, but I also love all the Botanical stuff too, so almost impossible to pick one for another, so guess I´ll NEED both of them ha ha ha. These are such delicious designs!